Our ATV and UTV Operator course has been developed for those with an occupational requirement to be trained to safely undertake work activities that involve the operation of an All Terrain Vehicle (ATV) and/or a Utility Terrain Vehicle (UTV). The goal of this course is to help you better understand what a ATV and UTV Operator responsibilities are and how to manage those responsibilities to protect your health and safety and your co-workers. 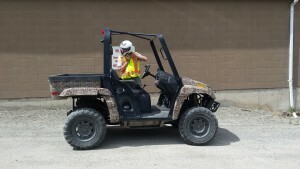 This ATV and UTV Operator course will also establish an understanding of the statutory requirements of the federal COHS, Provincial and Territorial OH&S legislations. We will achieve this through discussion, by participating in skills practice and operator performance evaluation.